When we refer to esthetic fillings we are talking about one of two types of natural-looking tooth-colored restorations that are substitutes for yesterday's amalgam and gold fillings. The simplest type of aesthetic filling is what people commonly refer to as "bonding". This filling is performed by the dentist in one single sitting and is comprised of a composite resin material that is placed into smaller cavities and bonded or adhered to the tooth chemically with special liquid "bonding agents". 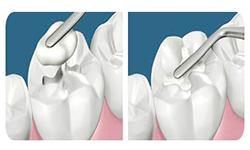 The second type of aesthetic filling is the ceramic inlay or on lay (partial coverage restoration). These restorations are commonly performed when the tooth being restored requires a larger filling and would be otherwise compromised by a weaker material such as composite resins. Ceramic fillings are some of the most aesthetic restorations that modern dentistry can offer. They are strong, natural looking and long lasting. Properly done, they will "disappear" into the tooth and look like a perfectly healthy intact tooth.